During Monday’s morning Mass, Pope Francis said children are curious and they find many bad things online. They should be helped not to become prisoners of this curiosity. He urged Christians to ask for the Holy Spirit who gives certainty against this unhealthy curiosity. Pope Francis on Monday called on Christians to pray for the grace to be able discern between good and bad curiosities and to open one's heart to the Holy Spirit who gives certainty in life. 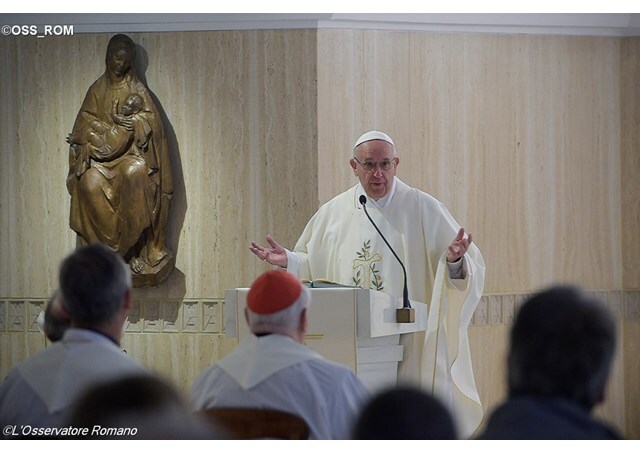 Celebrating his morning Mass at the Casa Santa Marta residence in the Vatican, the Pope described the interaction between Jesus and his disciples in the day’s Gospel as a healthy “dialogue between curiosity and certainty". Healthy curiosity of children Noting that life is full of curiosities, the Pope stressed on being able to differentiate between good and bad ones. He said children’s inquisitiveness is healthy, because as they grow up they notice things they don’t understand and seek an explanation. This, he said, develops autonomy and is also a “contemplative curiosity" , because children see, contemplate, do not understand and ask". Gossip – bad curiosity On the other hand, the Pope denounced gossip as bad curiosity, as it is being nosey about the life of others that ends up dirtying others, making people understand things that they do not have the right to know. This kind of bad curiosity "accompanies us all our lives” he said warning it is “it is a temptation that we will always have." However, there is nothing to be frightened of but one must be careful. The Holy Father said there are many curiosities, for example, in the virtual world, with mobile phones and other things... He said children visit sites curious to see and they come across many ugly things. “There is no discipline in that curiosity,” the Pope warned and urged adults to help young people live in this world, so that the desire to know does not became a desire to be curious that makes them end up as prisoners of this curiosity. On the other hand, the Pope regarded the curiosity of the apostles in the Gospel as healthy because they wanted to know what will happen and Jesus responded by giving them a certainty that "never deceives", promising them the Holy Spirit who will teach them everything and remind them of everything He has told them. The Pope said it is the Holy Spirit who brings certainty in our life, but not like a bundle of certainties. In the measure we proceed in life and ask the Holy Spirit opening our hearts, he said, the Holy Spirit give us the certainty for that moment, the answer for that moment. The Holy Spirit is the companion on the journey of a Christian, the Pope said. This talk between Jesus and his disciples, which is “dialogue of between human curiosity and certainty,” the Pope explained ends with this reference to the Holy Spirit, “the companion of memory” that leads to “fixed happiness” that does not move. Pope Francis thus exhorted Christians to go where there is true joy with the Holy Spirit, who helps them not to make mistakes.